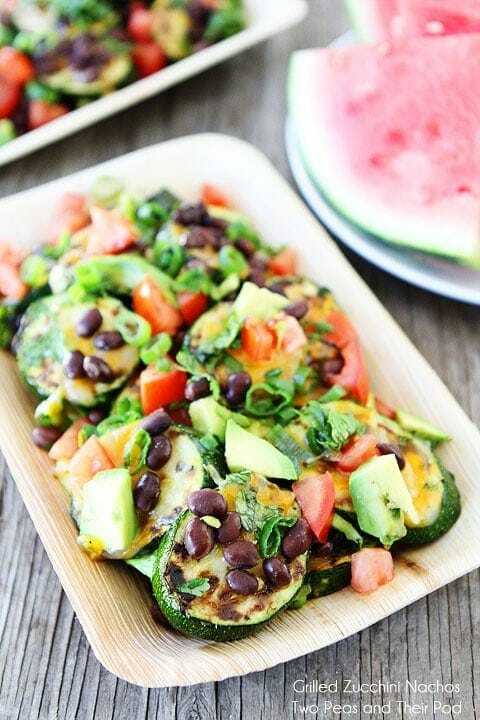 Grilled Zucchini Nachos-use zucchini as the chips and top with all of your favorite nacho toppings! A great recipe to use up the summer zucchini! It’s zucchini season! I know some people try to hide under their covers to avoid answering the door when neighbors stop by with zucchini, but I jump for joy. I will accept any and all zucchini with a big smile. If you need our address, just let me know. Our garden unfortunately hasn’t gave birth to any zucchini yet. So what should you do with your collection of zucchini? I love using zucchini to make salads, bread, brownies, cupcakes, and cookies! I also highly recommend you make Grilled Zucchini Nachos. Yep, you heard me, zucchini nachos! Oh, yeah! We have made Grilled Nachos before with tortilla chips, but since it is zucchini season, I thought it would be fun to use zucchini as the chips! Plus, I love the idea of a healthy chip! Bring on the veggies! Grilled Zucchini Nachos are easy to make and you don’t have to turn on the oven. Cut the zucchini into rounds, aka chips, and grill them until they are tender. Sprinkle cheese over the zucchini chips and grill until melted. Look at that cheesy goodness! Remove the cheesy zucchini chips from the grill and top with all of your favorite nacho toppings! 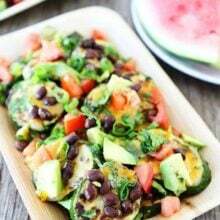 We topped ours with black beans, garden tomatoes, avocado, cilantro, green onion, and a squeeze of fresh lime juice. Put your garden zucchini to good use, make Grilled Zucchini Nachos. And if your neighbors knock on your door with a bag of zucchini, get out from under the covers, open the door, say thank you, and make Grilled Zucchini Nachos. And if you have an obscene amount of zucchini to use up, check out these 35 Zucchini Recipes. Don’t let your zucchini go to waste! Grilled zucchini rounds turned into chips and topped with all of your favorite nacho toppings! 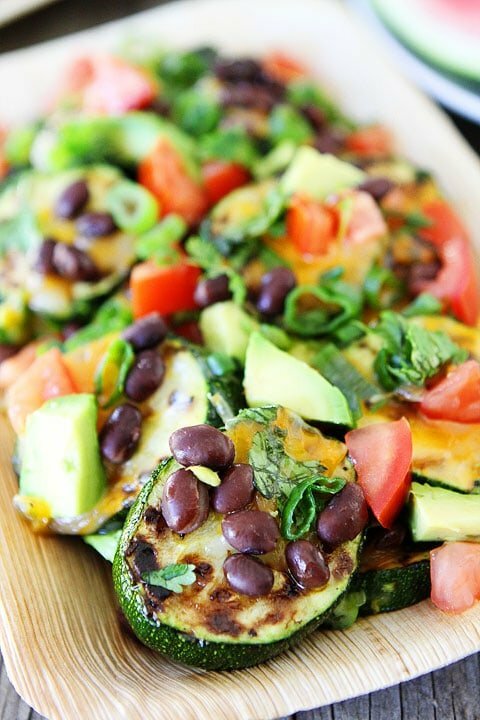 Grilled Zucchini Nachos are a great way to use up your summer zucchini! Put the sliced zucchini chips into a large bowl and toss with olive oil. Season with salt and pepper, to taste. Place zucchini on a a grill pan or directly on a hot grill, over medium heat. Grill for 4 to 5 minutes or until zucchini is tender. Sprinkle cheese directly over zucchini chips and cook until cheese is melted, about 1 minute. Remove zucchini from grill and place on a platter or onto plates. Top with black beans, tomatoes, avocado, green onion, cilantro, and a squeeze of fresh lime juice. Serve immediately. Since I live in the city I have yet to have a neighbor stop by and offer me some home-grown zucchini. 🙁 But I think I will have to make a run to the store and buy my own so I can try out these ingenious nachos! Love this idea and I think my 2-year-old would absolutely gobble these up. Thanks for the great idea! That’s brilliant-I’ve done eggplant chips, but not zucchini, in the oven before. But to take zucchini and top it with cheese and all the fixings? Very inspired. 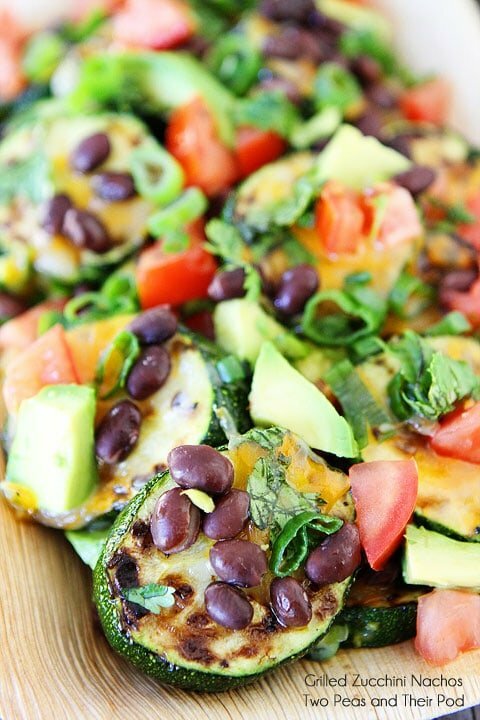 I love the idea of zucchini nachos! What a fun dinner idea! Can you believe I’m having trouble finding zucchini??? My friends’ gardens have blossoms but no zucchini yet, and the grocery store was out! 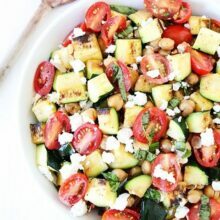 Such a great idea to use up summer zucchini and get a healthy twist on one of my favorite comfort foods! This is definitely the best zucchini recipe I have seen, Maria!! I’ll eat it every day if it’s like this!! Oh my. Those look delicious. There can never be enough recipes for zucchini! AMAZING! Best zucchini recipe I have seen in a while!! Now, I need some neighbors to bring me zucchini!! Love this idea! I need to make this today! Great idea! I like doing this with jicama too. Has a nice crunch to it! You know I love this! I can eat a whole plate! Guilt-free nachos! What a great idea, Maria. This would be a perfect option for football season, too. What a colorful recipes. I am always looking for ways to use up my zucchini and this is a top 5. 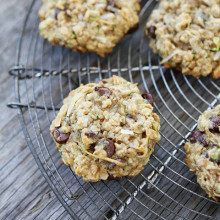 LOVE this alternative to using up zucchini! how creative! Geeeeeeeet out. I’d pay rent to live on your tongue. This is a brilliant idea! I bet my kids would like zucchini a lot more if I smothered it in cheese and other nacho toppings. Totally brilliant! What a great idea; so creative! What a GREAT idea!! I love how you always come up with the most inventive healthy recipes! Grilled Zucchini! One of my favorite grilled vegetables! Those sounds amazing as nachos! These nachos are pure genius! Can’t wait to try the recipe! Great Idea!! Where did you get your dish you served these in??? SO CUTE!! I can’t remember! Sorry! We’ve had them for years! Um….this is genius. Just genius. I would be just as happy or happier to eat nachos with grilled zucchini than the traditional way. Lovely idea, and I want to make this very soon! It’s a skinny nacho!!!! Awesome. What an amazing, healthy way to have nachos! You are a genius! A great way and the best nachos, so beautiful too. Nachos are my diet downfall. This is a wonderful way to healthify them. Oh my goodness, lady, this is genius!!! Must try these very, very soon! Oh my, Maria – these are brilliant! Yummy! Love this idea Maria!! Such a genius idea, Maria! You just made me crave nachos and I’m not sure when the last time that happened was! 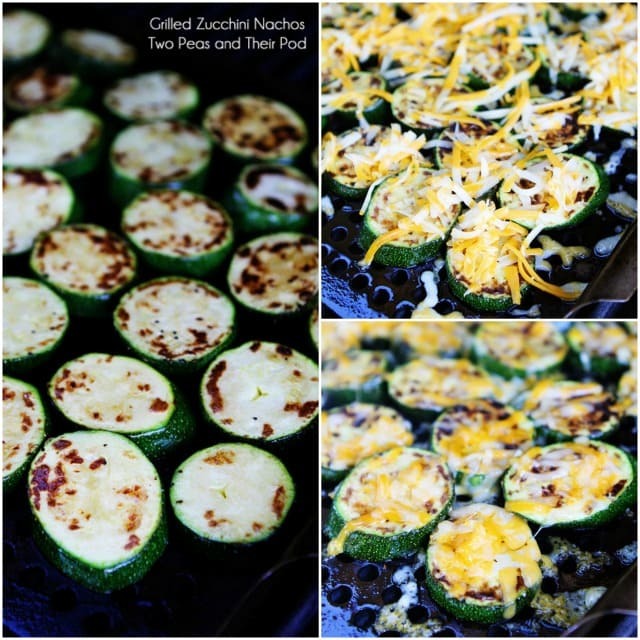 Love the idea of zucchini “chips”! YUM! I just repinned to Pinterest/homedepot on the “Garden Party” pinboard. Thank you for the inspiration. Hello! My name’s Jessica, and every week on my food blog, Floptimism, I write a post called the Weekend Wrap-Up where I share some of my favorite web finds from the past week. 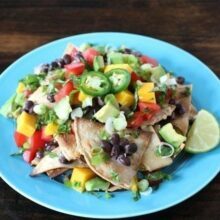 I loved this healthy twist on classic nachos so much that I featured your post on this week’s round up! I’ve included the link below in case you’re interested. Thank you for such incredible work, and enjoy your weekend! We looooooove zucchini at my house. I’m so excited for a new recipe to try out using it. Thanks! I made these tonight and they turned out great! 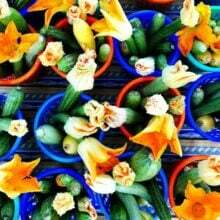 Since my garden is flourishing with the squash varieties, we are glad to have new ways to eat them. I’ve just made these for my dinner! They were yummy. 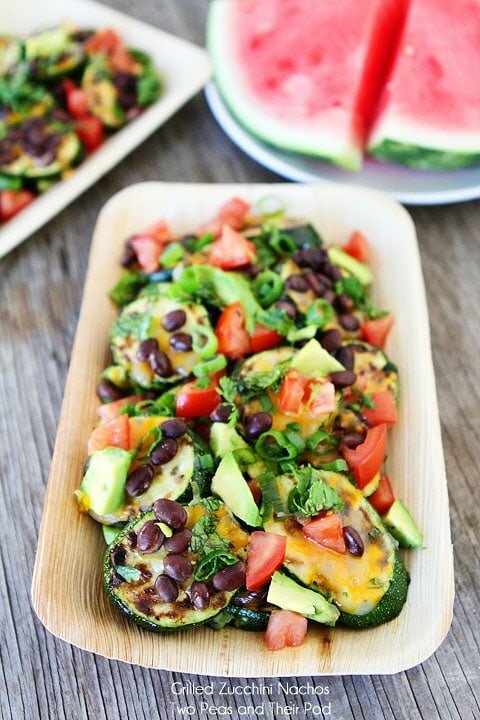 Nachos are literally my favourite thing to eat so I love the idea of a healthier version! They’re the perfect ‘cheat’ for being on a diet. Does this mean I get to have extra, extras???? Your recipes print in very very small lettering, which makes them very difficult to read printed copy. It would be nice if they printed in larger print. This is an awesome combo! Great idea. Pingback: CSA Week 12 | Nutrition.Health.Life. Saw these and made them instantly…so good I wish I had made more! I wanted a little bit of crunch so I broke up some tortilla chips to sprinkle on top. Thanks for sharing!! YES, this is such a good idea because everyone is up to their EARS in zucchini! I cannot tell you how many times each day my mom asks me to help her figure out what to do with everything in her overflowing garden. Thanks for the inspiration! Made this over the weekend using the broiler instead of the grill – loved it! Genius!! Can’t wait to make these! I love zucchini so much! All I usually do with it is saute’ it with onion and garlic. Although it tastes better, it is nice to learn a new way on how to prepare this oh so common veggies. Thanks! Oh my gosh… I just made these for dinner (with a slight variation — I used the ingredients I had on hand) and they were fabulous! Thank you! Is there a way to make these without a grill? My apartment complex does not allow them! I love zucchini too, but my kids hate the way I cook it. Maybe, if I try cooking it this way they’ll give it a go 🙂 Thanks for sharing. Made this for dinner tonight. It was excellent. Dh who is not fond of Nachos said i could make this dish anytime. Thanks for sharing. Made this again. My family is now calling this Not Your Mother’s Nachos. Thanks again. I love this idea! This sounds so much tastier than the pepper-nachos I usually do! I had to write about this for healthy tailgating food!! Check it out! Glad you enjoyed the nachos! I really love this amazing recipe.